We all have our own favorite comfort foods. A bowl of thick, rich, tomato soup paired with a crusty grilled cheddar cheese sandwich (for dipping, obviously) may not invoke the same cozy, nostalgic feelings for me that a piece of savory, flaky chicken pot pie does for you. I think that the foods we yearn for depend upon personal memories and comforting moments that we have stored in the back of our heads that are associated with our favorite feel-good foods. Tomato soup, grilled cheese, chicken pot pie, macaroni and cheese, spaghetti- I’m sure if I polled a crowd, all of these would come up. But listen up. I’m going to share with you a new comfort food that will not only be a crowd pleaser in your home but also a dish that you will positively crave. Perfect for a cold winter evening, easy enough for a Wednesday night, and special enough for a homecoming meal… [my brother requested that his wife make this for him upon his return from Iraq] …. I introduce to you a recipe that my mom received from a friend of hers many years ago. In turn, it has been within our family for as long as I can remember. 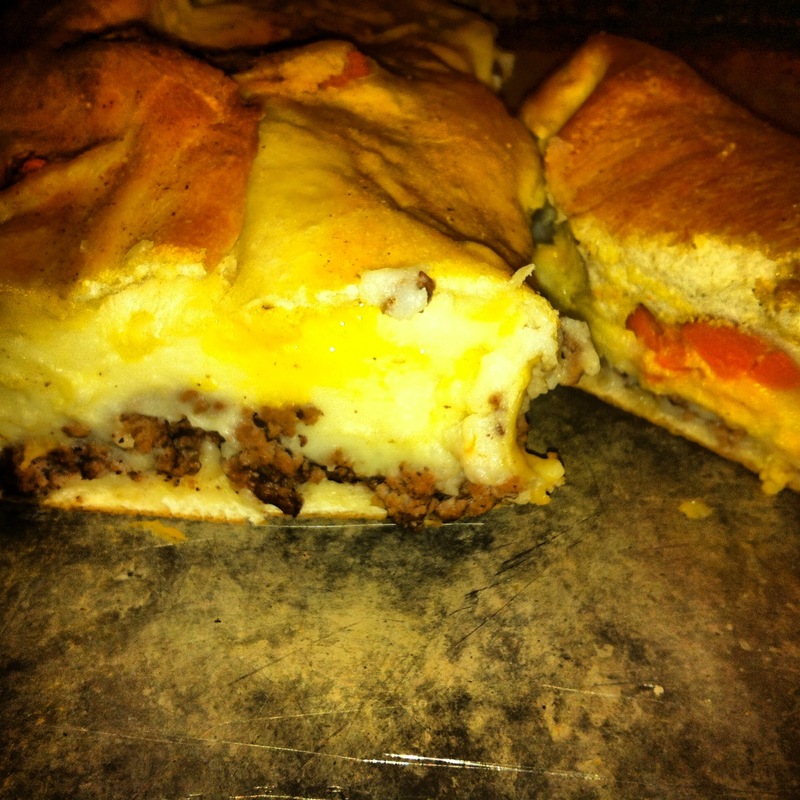 Multiple comfort foods rolled into one delicious, warm, cheesy, gooey, and hearty meal: does it get any better? 1 loaf frozen bread dough, thawed. salt, pepper, garlic powder, paprika. Thaw bread according to instructions on packaging: place the dough on a plate, spritz with some cooking spray, cover with plastic wrap and refrigerate it overnight allowing it to thaw. Keep it in the refrigerator because you do not want it to raise- just thaw. When it’s ready: preheat the oven to 350 degrees. 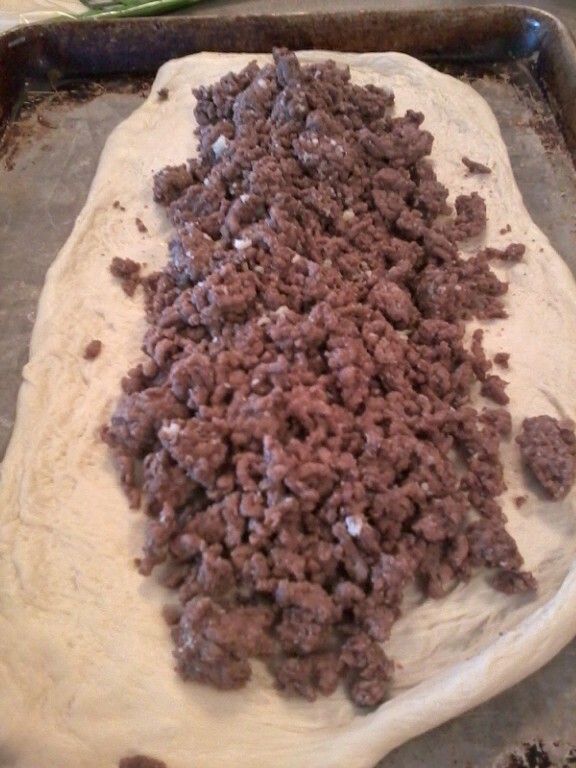 Brown the ground beef in a pan- season to your liking with garlic and onion powder, salt, and pepper. Drain excess grease and let cool down a bit. 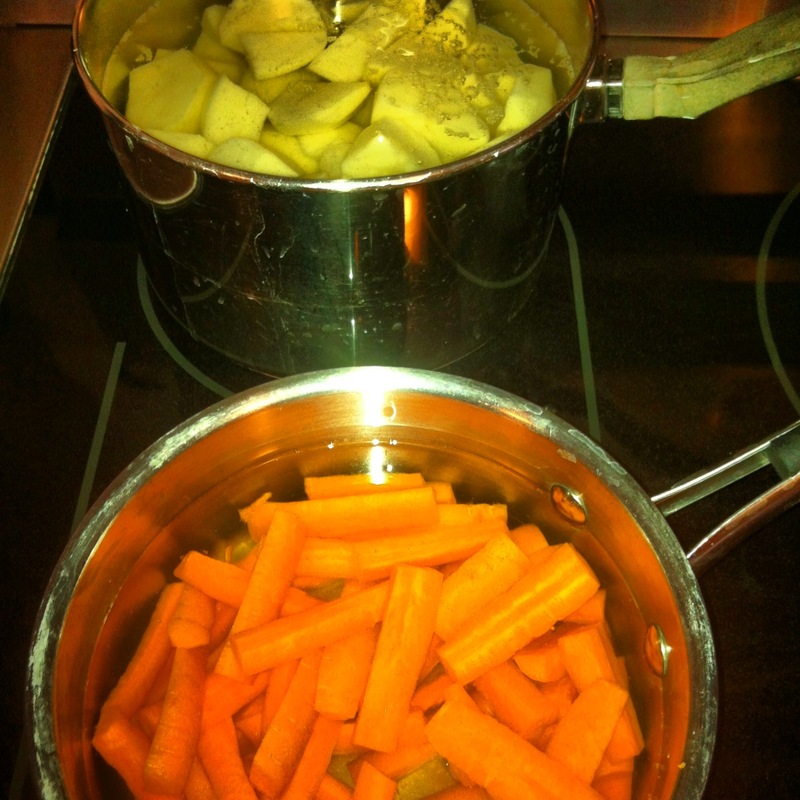 Cut your carrots into thick sticks and boil until fork tender. Drain and dry off the excess water. Spray a 13 x 9 pan/ large sheet with non stick cooking spray and gently stretch and flatten out your thawed dough. 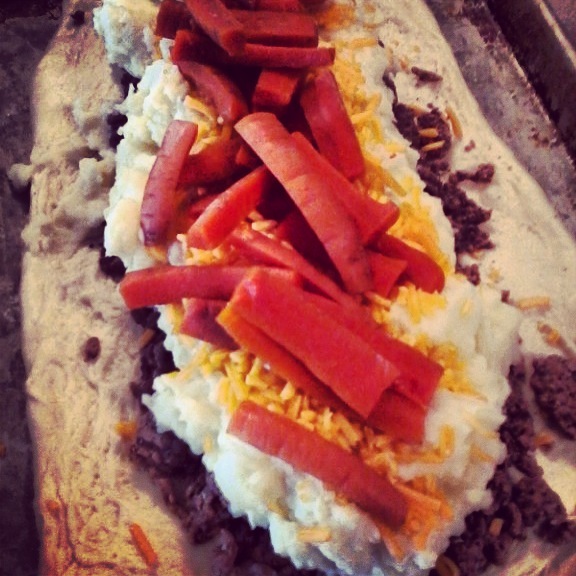 Lay the cooked and seasoned ground beef down the center, followed by the potatoes and then the cheese. Finish with the carrots. 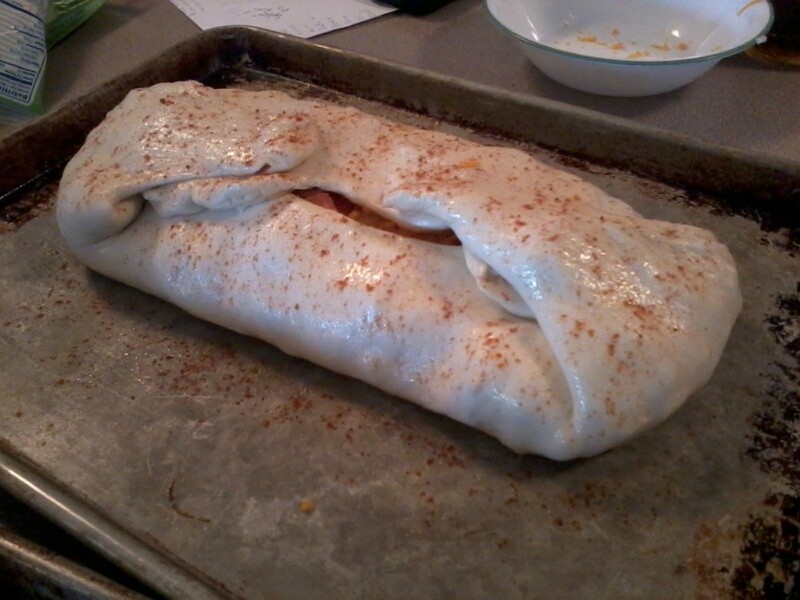 Pull up the dough around the sides to cover all of your fillings. You may need to work at it a bit to get it to close up- pinch the dough to seal at the tops and ends. Sprinkle the top with salt, pepper, garlic powder, and paprika. Bake for 20 minutes and then spread a little bit of butter on top of roll. Return to the oven for an additional ten minutes until golden brown. Go back for seconds, maybe thirds. Aren’t you glad you made two? Thanks Nat! The blog will keep Soph’s Meat Roll rolling on thru the years! Sophie would be happy! Also special enough for when your sister-in-law visits for the Super Bowl 🙂 Love you!